A grader demolishes a structure at Centenary Park. Courtesy photo. 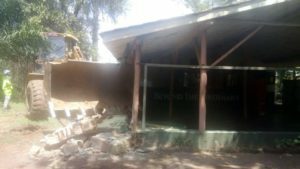 The demolition of illegal structures at the Centenary Park has began in earnest with graders pulling down restaurants and bars. The demolition exercise that began Monday morning marks the climax of a protracted battle for the park pitting prominent business personalities against high ranking government officials. Centenary Park land belongs to the Kampala Capital City Authority (KCCA). It was leased to Sarah Kizito wife to former boxer and Kampala Central Division chairman Godfrey Nyakana Amooti in 2006 who went ahead to develop it. When the lease expired Ms Kizito claimed ownership of the land. She had vowed not to vacate the land even after National Water and Sewerage Corporation (NWSC) maintained it wanted to use the land to improve the city’s sewerage system. KCCA, UNRA, NWSC and Parliament have for long asked Kizito to leave the land in vain. 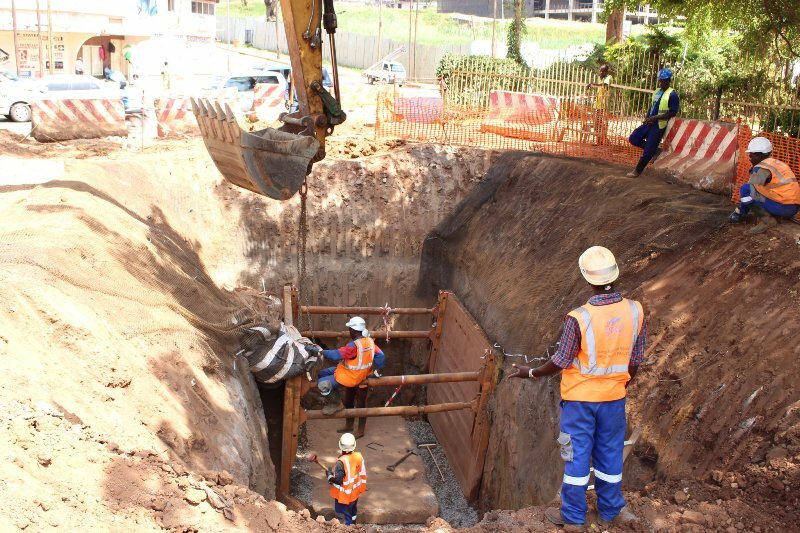 NWSC instals sewer pipelines at Centenary Park. Courtesy. Centenary Park located along Kampala- Jinja road opposite the Electoral Commission is one of Kampala’s public open places. It was leased out to Nalongo Estates, a private developer, whose director is Sarah Kizito in 2006 from the then Kampala City Council (KCC) in form of a management contract. The management contract recommended the new tenants, Nalongo Estates, to manage the public space, construct semi-structured buildings on the land and also leave space for a public leisure park for activities such as weddings as well as public gatherings. The lease contract between Nalongo Estates and KCCA was supposed to last 10 years from 2006 but in May 2016 after the tenants requested a renew of the contract, KCCA declined and instead went for another government development program that will affect the park. NWSC staff instal the sewer lines at the Centenary Park. Courtesy photo. This meant that the set up structures on the park land would be demolished, something that did not go well with Nalongo Estates director Sarah Kizito who said it was very unfair treatment yet she had approved projects and plans presented to KCCA for the park land. This sparked off a controversy for the park land between the landlords and Nalongo Estates management. About two weeks ago, Speaker of Parliament, Rebecca Kadaga ordered the Parliament’s Committee on Commissions, Statutory Authorities and State Enterprises (COSASE) chaired by Bugweri MP Abdu Katuntu to investigate the matter. After meeting several stakeholders including Sarah Kizito and KCCA executive director Jeniffer Musisi, among others, the committee on July 6 recommended that the lease with the tenants, Nalongo Estates, should not be renewed and ordered the demolition of the structures. On Friday, there had been heavy deployment of security at Centenary park where Special Forces guards, an elite command force in charge of security for the President were seen manning the area. However, after a closed door meeting with the President on Friday at State House Entebbe, President Museveni ordered the demolition of the structures so that government infrastructure projects commence.